The earth Eugenios and Makarios. Countless torments Eugenios and Makarios. 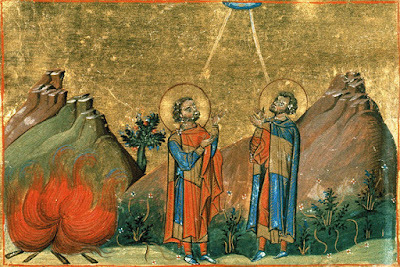 Eugenios and Makarios were pious Christians who were arrested during the persecution of Emperor Julian the Apostate (361-363) for refusing to sacrifice to the idols. Brought before the tyrant, they steadfastly confessed Christ and rebuked the Emperor for having abandoned the Christian faith in order to worship lifeless idols. For this reason they were ordered to be tortured. After binding the Saints with thin broad belts, the executioners had Eugenios and Makarios hung upside down over a burning fire of dung. After many hours they were taken down and made to lie down naked on a burning hot gridiron. The Holy Martyrs endured these torments with their eyes fixed on Heaven, strengthened by divine grace, and at the same time they continued to rebuke the Apostate Emperor for his wickedness and impiety. After such inhuman punishments, Julian was weary that he failed to bend the resolve of the Saints, so he had them bound and exiled to Mauritania in Africa, just opposite Algeria. The Holy Confessors rejoiced that they were made worthy to be exiled for Christ, and along the way chanted joyfully: "Blessed are those that are undefiled in the way, and walk in the law of the Lord" (Ps. 118:1). When they arrived they proclaimed their faith to the pagans of that area to illumine them with the knowledge of the truth, then went off to a high mountain to live alone in a cave in prayer and fasting and asceticism. While on the mountain looking for a cave to make their dwelling, the inhabitants warned the Saints that in a nearby cave there was a ferocious dragon that terrified the whole region. After they asked for the location of the cave, they approached it and prayed on their knees. Suddenly a bolt of lightning came down from the sky and scorched the dragon as he attempted to flee. All that was left were ashes mixed with dust, and a foul stench permeated the air. This miraculous intervention of the Saints caused the pagans to place their confidence in the two Confessors, so they came to believe in the power of Christ. The Saints therefore made their habitation in the cave of the dragon, where they prayed continuously for thirty days, neither eating or drinking anything. Upon completing this labor, they heard a heavenly voice say: "Servants of the true God and our Lord Jesus Christ, go to the rock that is next to you." Turning they saw a light coming from a rock, and in a wondrous manner the rock split in two and from within there gushed forth a spring of water, which they drank from and were refreshed. Thus they recovered their physical strength and had their hunger and thirst satisfied. On the thirty-eighth day they supplicated God to release them from this present life and move on to the next life. The Lord hearkened to their entreaty, and received the souls of both of them, as they glorified and blessed Him.